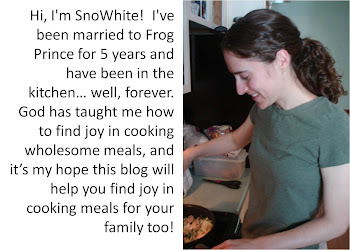 Finding Joy in My Kitchen: The Blessing of Food. Here at Finding Joy in My Kitchen we talk a lot about food. And, we are so blessed. At our very fingertips are hundreds/thousands of recipes for me to gaze through and decide what we want to eat during the week. We are blessed to have financial resources and transportation to travel to our local grocery store and purchase ingredients to help us make these meals. 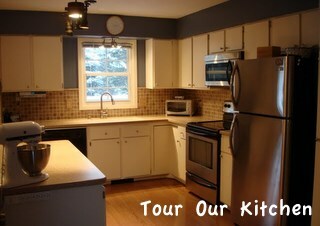 We are blessed with a kitchen to make food. We are just plain blessed. Every year on my birthday I think about all the blessings God has poured out on my life, and every year I am amazed. This year, the blessings of food and clean water and shelter have been on my mind. But, especially the blessing of food. And, since today happens to be my birthday, I am going to do make a tangible contribution to share the blessing of food with those that do not have such blessings. For my birthday, I am making a donation to Feed My Starving Children. Feed My Starving Children is an amazing organization that packages nutritionally balanced and appropriate meals for children in countries that do not have access to food. The food packets, which they call Manna Packs, consist of rice, soy, vegetable and chicken. On package will serve 6 children 1 meal, or provide 6 meals for 1 child. It costs just 26 cents to feed a child one meal. That 26 cents can change a life; and $1.44 will change 6 lives. I'm extending an invitation to you today -- an invitation to share the blessing of food beyond just posting a recipe. We share the blessings of food day in and day out with others who are blessed to be able to purchase food and cook it, but today, I'm asking for you to join with me in extending that blessing to those who don't read our blogs and enjoy our recipes. 94% of your donation to Feed My Starving Children will go directly to the food - which is just amazing. Would you consider feeding 6 children today? Based on my current statistics, I know that there are over 5000 people stopping by here every day, and another 3-4,000 subscribing via readers. What if we were each able to give $1.44 to Feed My Starving Children today to share the blessing of food? If 5,000 of us gave $1.44 to Feed My Starving Children today, we'd be able to feed 75-100 school children FOR A YEAR. Frog Prince and I will be sharing the gift of food this year for my birthday, and in a couple of weeks, we'll be going to Feed My Starving Children to pack up this food and send it off to the children. I invite you to the birthday party celebration and hope that you'll consider giving a gift of food! And, please, spread the word - invite others! Let's share the blessing of food. If you do make a donation, please enter "Finding Joy in My Kitchen" in the Tribute section, so that we can keep track of how many kids our community will feed. I can't wait to package up that food. Happy birthday Sno!!! What a great way to celebrate too. You are right, we are truly blessed for the food we have. I, for one, know that I take that for granted a lot. What a beautiful post! We are truly so very blessed--unfortunately, many people take so much for granted! Wishing you a very Happy Birthday and a wonderful year to come! I'm off to make my donation..
What a great way to give back on your birthday! Happy birthday! Happy Birthday! What a great idea to give to FMSC. We are definitely greatly blessed! Happy Birthday!! What a great post and great thing to do. Thanks for bringing it to my attention. We are truly blessed. We just did something similar to this for Christmas- although we actually packed the food ourselves. It was called Kids Against Hunger. Isn't it amazing what 25 cents can get you? We are so truly blessed. What a great idea, Sno! And you're right-- food (and clean drinking water) are such a HUGE blessing! Thanks for reminding me of this today. And HAPPY BIRTHDAY!!! Done! Say, perhaps you'd consider putting a counter in your sidebar so we can track the meals? Might also remind folks who tend to put these things off.